This beautiful and versatile bench with a colourful patchwork pattern will enchant you with its floral design and smooth colours. It is an artful piece of furniture that brings a touch of romance in your living room, hallway or bedroom. The beautifully curved armrests and the comfortable cushioning guarantee a comfortable seating experience. 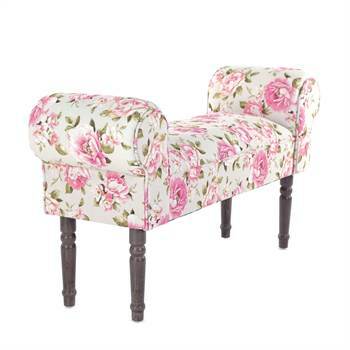 Seating bench ROSE FLOWER | Multicoloured | Pure romance! Detailed flowers in pink, green and beige embellish this pretty bench on a sandy background. Together with the dark and sturdy wooden feet, the bench ensures a stable stand and creates a romantic atmosphere in your rooms. Do you like the patchwork design or do you like it a bit more colourful? Then maybe our benches BUTTERFLY or INDIA are the right thing for you. Just have a look at our online shop! Measurements (app. ): Length: 39.5", Width: 19.5", Depth: 12", Seat Height: 15.5"